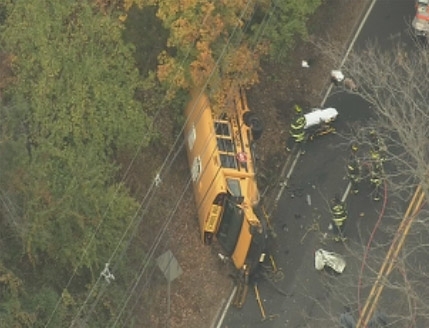 Four people were injured this afternoon in a serious crash involving a school bus and a sedan in Princeton, NJ, in Mercer County. It happened around 3:00 pm on Route 206 (Lawrenceville Road) near Hutchinson Drive. A BMW sedan driving north on SH 206 crossed into the path of the school bus which was going south at a curve in the road. The sedan struck the bus on the front left bumper flipping the bus over on it's right side and sending the BMW spinning. Both vehicles sustained heavy front end damage. The 44-year-old bus driver, a 16-year-old student and a 71-year-old teacher’s aid were taken to University Medical Center with non-life threatening injuries. The 26-year-old driver of the BMW was taken to Capital Health Systems also with non-life threatening injuries. Authorities continue to investigate the crash. Police have arrested a man from Feasterville, Bucks County, for burning American flags and other items removed from Veterans' gravesites. 29-year-old Anthony Davis Carter is charged in five separate incidents that took place at Roosevelt Memorial Park at 2701 Old Lincoln Highway and Rosedale Memorial Park at 3850 Richlieu Road. He is accused of removing grave site American flags, veteran flag holders, and grave site decorations then placing them in a pile and lighting them on fire. Carter was linked to the crimes by DNA evidence. Bensalem Police have charged him with institutional vandalism, arson, and related offenses. The cities of Philadelphia, Pittsburgh, and Lancaster along with five Democratic lawmakers are filing suit against a new Pennsylvania law signed last week by Governor Corbett and backed by the National Rifle Association. They were all in Philadelphia to announce the suit. The law allows anyone in Pennsylvania to file suit against a local municipality in order to challenge local firearms ordinances regardless of whether they live there or not. The plaintiffs in this case want to preserve the ability of cities with high gun crime to write their own gun laws without being challenged by someone from the middle of the state where gun priorities are different. They say the law in unconstitutional because it was added onto another unrelated bill at the last moment. The NRA did not comment.